In the first inning, Texas State got their offense started when Demina singled on a 1-1 count, scoring one run. In the bottom of the second inning, University of Texas Longhorns tied things up at two. University of Texas Longhorns scored one run on a stolen base. Texas State pulled away for good with four runs in the third inning. 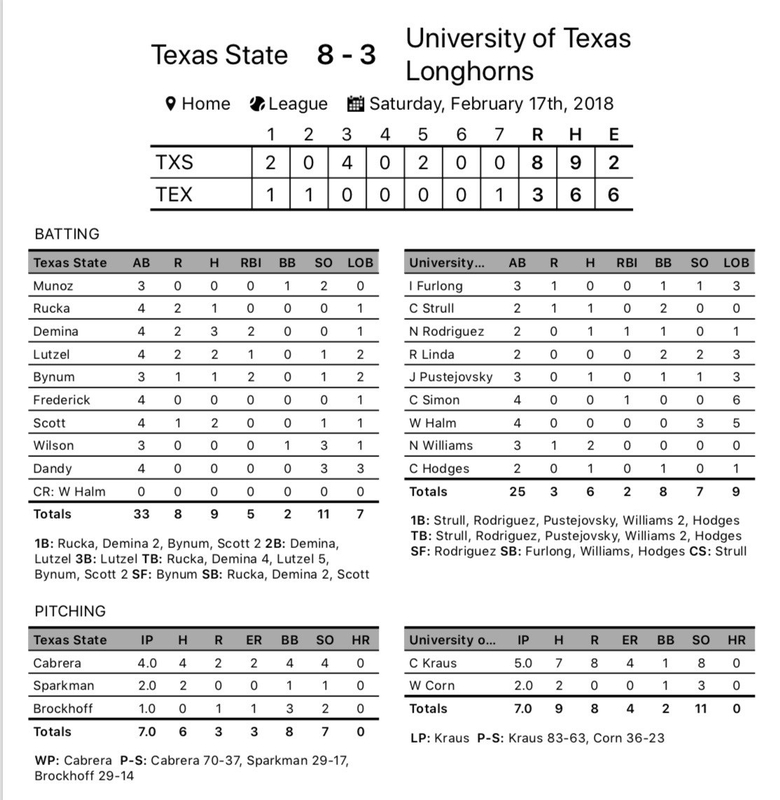 In the third Demina doubled on a 1-2 count, scoring one run, Lutzel doubled on a 1-1 count, scoring one run, Bynum singled on a 1-0 count, scoring one run, and an error scored one run for Texas State. Cabrera took the win for Texas State. He surrendered two runs on four hits over four innings, striking out four. Sparkman and Brockhoff entered the game out of the bullpen and helped to close out the game in relief. Connor Kraus took the loss for University of Texas Longhorns. He went five innings, allowing eight runs on seven hits, striking out eight and walking one. Nick Williams led University of Texas Longhorns with two hits in three at bats. Texas State collected nine hits on the day. Demina, Scott, and Lutzel each managed multiple hits for Texas State. Demina went 3-for-4 at the plate to lead Texas State in hits.